After a lapse of three years I was thinking it was about time I did another Coast to Coast, as were Martin and Sharon Wickner, and they decided they would do the event on behalf of the EACC and call it the East to West Adventure. In the interest of impartiality I will call it the East Coast to West Coast. As a ‘Billy no mates’ the event is a logistical nightmare, however Clive and Ann Fletcher were attending and I was no longer a Billy, their help to me being over and above what would normally be expected. Martin and Sharon had already done a recce and were offering to provide backup. Game on. 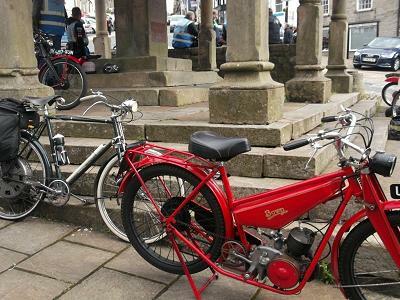 I loaded the car with two autocycles and headed up north on the Friday; although I had been having issues with the car (and joined the AA) it ran faultlessly to Barnard Castle for a walk about. 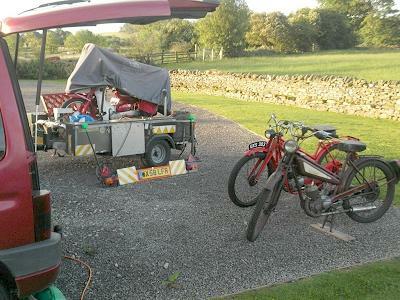 Then on to Mickerton where it was parked up on Clive and Ann’s ample camper plot. One swift half in the pub and I went to visit Rick (not in) who bought the Derny Tandem from me and provided support for me last time, back to Barnard Castle for fish & chips and another swift half and it was Bedlingo time. 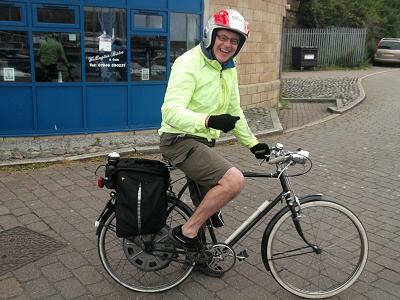 We had a plan for the morning: ride the 20 miles to the first EACC check point at Shildon (it had been a wet horrible day). I woke at 05:00 to brilliant sunshine and the pesky midges were out in force; not long after Clive appeared and announced ’change of plan’ we will ride the 40 miles to the Start. Right from the outset the Bown didn’t appear to be running at its full potential but we made it. 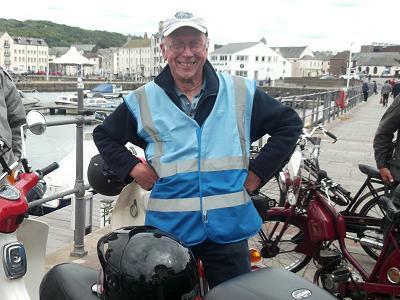 After an certain amount of initial hostility I upped my NACC status from ‘Lapsed’ to ‘Re-instated’ and collected a Blue Tabard which remains unused as I was riding the updated and checked route with back up cover provided by Martin. There was a good turn out and it was great to catch up with many folk. 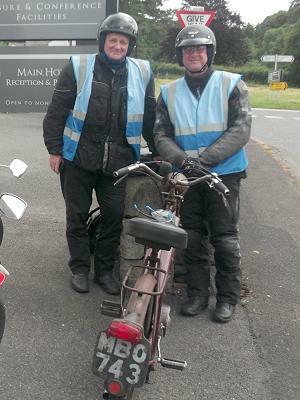 It was a pleasure to meet Martin’s long time mate Neil who was riding with us and Ron Patterson who also signed on with us on the only cyclemotor to be seen. The Bown was definitely down on power and was soon left behind by Sharon and Neil but I did see the Cyclemaster a few times as Ron supplied LPA and some HPA at times. 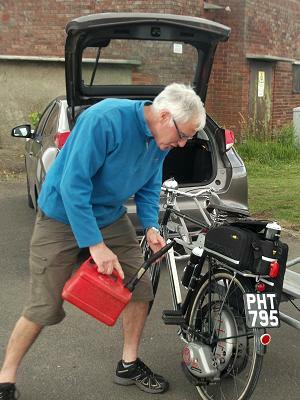 I arrived at Shildon with Martin who had recovered a big bike that had a blow out but Sharon and Neil were nowhere to be seen. After a while they appeared and we got a message that Ron was going straight on. Next stop was Staindrop for lunch on the green, then to the camp site from where Clive & Ann joined in and Martin kindly picked up my spare bike, bags, etc. On to High Force where we met up with several others including a rider who was on an ex-Billy Doy PC50 that I had met before. It did look as if Martin was going to do his second recovery of the day but the Quickly eventually fired up. It’s a long mainly uphill crawl to Alston and the Bown just made it but cried enough just as we were at the top of the cobbles and I free wheeled down to the Market Cross. We then visited the Hub Museum of local stuff which also included many bikes and motorbikes, manned by an enthusiastic volunteer it was well worth the Â£2 entrance fee. We tinkered with the Bown but it didn’t want to play any more. A nice meal in Alston House (where Martin & Sharon were staying) and a pint in the Cumberland and it was time to retire to my digs at the Victoria. Day 2: Sunday 25th June. Breakfast at the Victoria and I was set up for the day! My poorly Bown was consigned to the sin bin and the New Hudson was fuelled up. 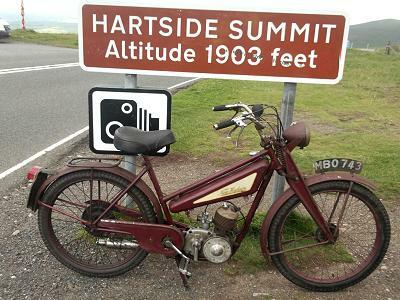 It was very windy up to Hartside and thankfully the New Hudson performed well. A quick photo and we were away again. 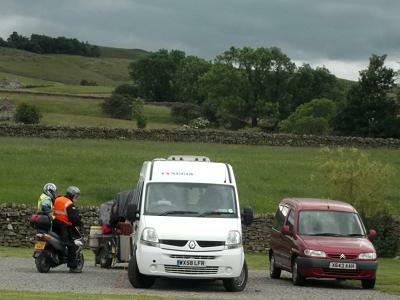 Derek, Andy and Frank also on New Hudsons had joined us for a rural route that avoids Penrith. On rejoining the old route Derek was not feeling too well and spent the rest of the day in the van with Martin. Although not a check point for us we stopped along with several others at the old smithy tea rooms (and toilet). We passed the Sun Inn, and carried on to the ‘barn with 3 red doors’, which has been converted into a major attraction known as the Lakeland Distillery for lunch. Clive and Ann returned from here back to their camper at Mickerton. Through Cockermouth and we pulled up and Martin helped a Ducati moped rider with a locked up rear wheel. We turned off the main road and arrived at the north of Whitehaven, through the one way system and onto the Beacon. We made it. Super recovery was there and I must say we had many happy moments with all on the run (just one loss of a personal friend to me). A very pleasant evening was had in the Brewers Fair along with NACC members Gary and Andy. …when the phone rang, it was Clive. ‘Where are you? We are waiting for you at Keswick.’ Clive had plotted a route all the way back to Mickerton for us avoiding the A66 as much as possible. All I had to do was load just the one bike and return to Martham. In conclusion: What a great event and I am glad I competed! 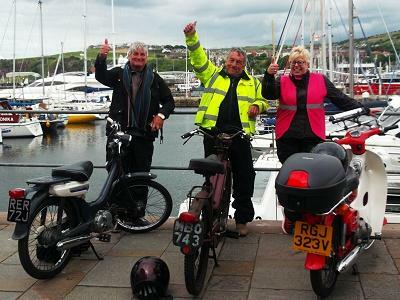 No apologies for the copious use of the words Clive, Ann, Martin, and Sharon as they all provided great support for me during and beyond the event (having spent a short break on the Isle of Man my Bown, bags, etc, were delivered home the next weekend).